IEA Hydro initiated a programme (Phase I) to investigate the value of services provided by storage hydro projects through the establishment of the economic values of energy management, water management and other socio-economic services. All hydropower projects which have any form of reservoir (even diurnal storage) are multipurpose and the services analysed are potentially applicable to all projects. Historically, the broad range of energy and non-energy services provided by hydropower plants have not been explicitly valued, being part of a utility’s mission. Since the start of Phase I, two key issues affecting the hydropower sector have arisen; the penetration of variable renewable energy (VRE) sources has increased substantially and the potential impacts of climate change are being recognized. These dynamics pose both challenges and opportunities for hydropower and require further exploration and analysis beyond the scope of the original Annex work. This will form the basis of Phase II. To present a holistic coverage of the role of hydropower in providing hydropower balancing and flexibility services to the electricity grid. This will allow hydropower developers, agencies, regulators and stakeholders to have a clear understanding of the issues and options for management and mitigation. To highlight the important role for hydropower in new and transitioning power systems globally. This will enable the appropriate valuing (and incentivizing) of hydropower balancing and flexibility services. TASK 3 – Hydropower Balancing and Flexibility Roadmap. To collate the outputs from Annex Tasks into a Hydropower Balancing and Flexibility Roadmap and its dissemination. IEA Hydro’s work on Valuing Hydropower Services (Annex IX) included a multi-country review that investigated the many factors contributing to the full value of hydropower and its associated services. 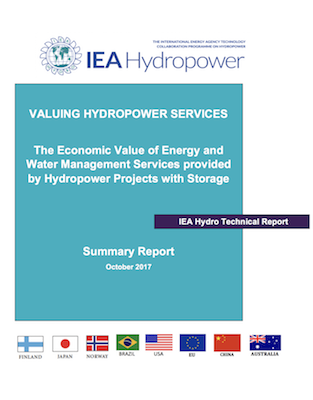 VALUING HYDROPOWER SERVICES: The Economic Value of Energy and Water Management Services provided by Hydropower Projects with Storage was published in October 2017. 1. Identify the organisations interested in participation and collaboration and the staff within these organisations who will participate. Case studies will be used to validate economic assessment methods, quantifying the added value created by a specific hydropower scheme, in a given river basin, through its various multipurpose enabling functions. 3-5 December, 2018, Phase II Kick-off meeting, Brussels. Download the invitation to attend. Certain annex information is protected and can only be accessed by members. Please login with your username and password to view the page.